Day 1 Our exploration begins at 8AM, meeting in downtown Anchorage at previously arranged locations. Dispatching quickly with Alaska’s largest city, we’ll head for more tranquil locales, turning south and hugging the shore of Turnagain Arm where the Chugach Mountains meet the sea. Rising up over Turnagain Pass in the Kenai Mountains we’ll then descend toward the Gulf of Alaska and the scenic town of Seward, situated at the uppermost reaches of Resurrection Bay. A deep water port that remains ice-free all year, Seward was one of the earlier Alaskan settlements, serving the mining and various trades of the Interior, as the southern terminus of the state’s single rail line. It is also the historic start of the Iditarod Trail. Surrounded by mountains, the scene is quite impressive, with the quaint downtown nearly at water’s edge. 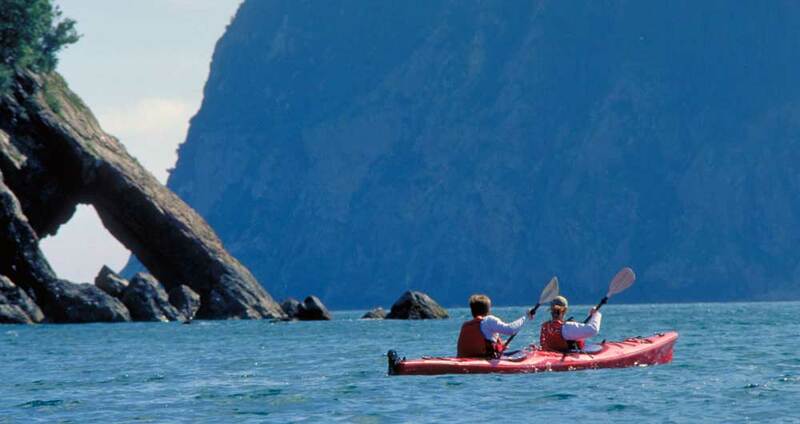 After lunch, we’ll head out to Lowell Point for our afternoon sea kayaking exploration of the west side of Resurrection Bay. 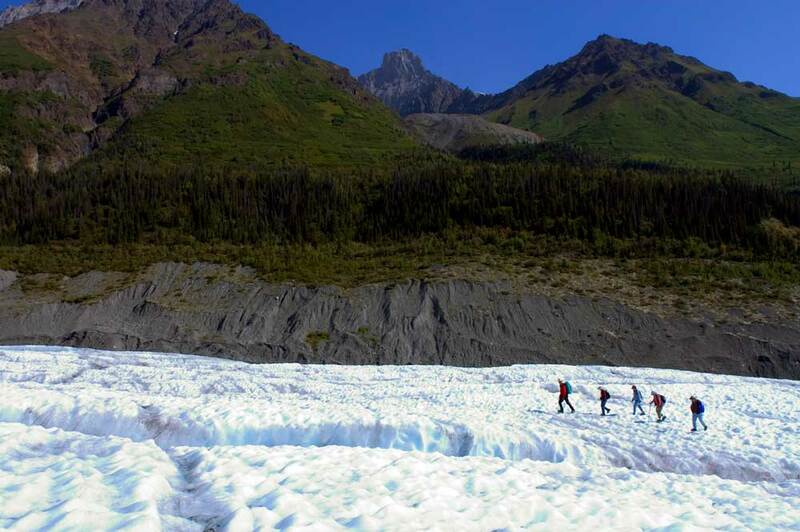 Back to land, we’ll head back through town to the turn-off accessing Exit Glacier of the Kenai Fjords National Park, walking up to its terminus while noting the dates of its historical retreat (hint: where we parked was mighty icy about World War I). After all this fine fresh air, it’s time to check in at the Harbor View Inn and have a nice dinner downtown. Day 2 After breakfast we’ll be first in line at the impressive Seward Sea Life Center, to garner a good background for the day’s foray into the maritime world. Boarding our vessel late morning, we’ll head out of the bay and around the point, and into the Chiswell Islands Wildlife Refuge, sliding between the rocky islands that are home to an incredible variety of marine mammals and sea birds. Reaching Kenai Fjords National Park, the vast majority inaccessible by road, we’ll head into Aialik Bay and linger off the face of a calving glacier for an otherworldly experience. We’ll cruise right up to the rugged coastal cliffs, providing wonderful opportunities for viewing murres, puffins, harbor seals, and sea lions, with the stretches in between always holding the promise of porpoises, sea otters, humpback whales and maybe even orcas. Arriving back in late afternoon, we’ll then head back up the road through the Kenai Mountains to the end of the road and the delightful little town of Hope on the shores of Turnagain Arm. One of the oldest gold rush communities in Alaska, Hope boasted three thousand souls long before Anchorage existed. As gold rushes pass so did many of the people, with now about two hundred folks in the community. Its unique atmosphere is quite palpable, in the many log cabins, the log Social Hall, the one room schoolhouse and certainly in the local folk that have chosen to call it home. It’s a piece of Alaska many have in mind before they come. We’ll lodge for the night in Discovery Cabins on the edge of rushing Bear Creek. Day 3 After breakfast we’ll pick up the Sterling Highway toward Homer. Enroute we’ll follow the beautiful (and quite famous for salmon) Kenai River through Cooper Landing, where bald eagles quite frequently gather to scour for leftover fish. We’ll pass through Soldotna, and stop at the historic center of old Kenai, where there was any early Russian settlement prior to Alaska’s sale. Skirting the eastern side of Cook Inlet, the towering volcanoes of Iliamna, Redoubt, Spur, and Augustine frame the Alaska Range on the opposite side. We’ll drive down to the water’s edge and catch the unique fishery of Deep Creek, before visiting the photogenic old Russian Orthodox Church nearby. Situated on the prominent bluff above the old native village of Ninilchik, the light in the church belfry long served as a beacon for vessels on Cook Inlet, in the days before GPS. The views are quite regal in any direction. Passing through Anchor Point, the most western point on the nation’s road system, we arrive at the lookout above Homer, needing no explanation as to why this is a favorite destination of many Alaskans. Glaciers and mountains rim the far view, with Homer below, and beautiful Kachemak Bay in between. We’ll head to the wonderful Islands and Oceans Center for a fascinating look at the uniqueness of this area, and insight into the thousands of miles of extreme wilderness of the Aleutian Chain. Just out back is Bishop’s Beach, begging for a beach combing stroll. Homer has long been known as an artist’s community and wandering the main street yields several funky emporiums that prove just why. Later we’ll visit the eclectic Pratt Museum, gaining further insight into both the area’s early history and chapters more recent–namely the Exxon Valdez Oil Spill. Dinner will be at a local institution, whose decor and cuisine is better experienced than explained. Lodging will be just below our former lookout, with a magnificent panorama that might just beg for a long linger before bedding down. Day 4 Arriving at the end of the Homer Spit mid-morning, we’ll poke around a bit before boarding the boat to cross the picturesque Bay. With the nearby mountains and glaciers on the other side of the bay and the Alaska Range across the mouth of Cook Inlet, it is truly a beautiful mix of geography. Aiming toward the mouth of the Bay, our captain will circle Gull Island and a few others en route to our destination, giving great explanation to the sights before us. Early afternoon finds us on the dock in the unique community of Seldovia, inaccessible by road. Originally and still a fishing village, the name comes from the Russian word for salted herring, as this fish was the reason for its existence, prior to the purchase of Alaska in 1867. Seldovia is also a place of refuge for artists and those looking for a little less access and the pace of life that it brings. It’s a special little town to wander, with the great Sitka spruce forests unlike any other we’ve seen, starting at the end of almost every street. A good stroll is in order down the historic boardwalk, vestige of the pre-earthquake vitality of Seldovia, before dinner at the always excellent Tidepool Cafe. Our lodging for the night is in the waterfront Boardwalk Inn overlooking the boat harbor, where sea otters are a frequent sight. Day 5 The morning is as leisurely as it should be, with time to further explore the town or just watch the tide come in out the back door. Those looking to stretch their legs might try the “Otterbahn”, a great little trail starting by the school that weaves through tall grass and spruce thickets to end at the ocean for an unlimited opportunity to stroll or beach-comb. We’ll then head to the nearby airstrip to catch our air taxi quick hop back across the bay to Homer. From above the perspective is priceless. It’s almost hard to get back in a vehicle again, but we’ll still have time to peruse a bit more of this town that draws so many for its beauty. Lunch will be in a local eatery. We’ll know the way back north by now, so Hope will seem like home when we get back to our snug log cabins. A barbecue is planned on the deck of the lodge, with a creekside campfire an apt possibility afterwards. Or, there might be those that prefer to head “downtown”, to Main Street that ends in the ocean, and the Seaview Bar that is often a colorful mix of visitors, locals, and gold miners still eking an income from the creeks. The music is often phenomenal too. 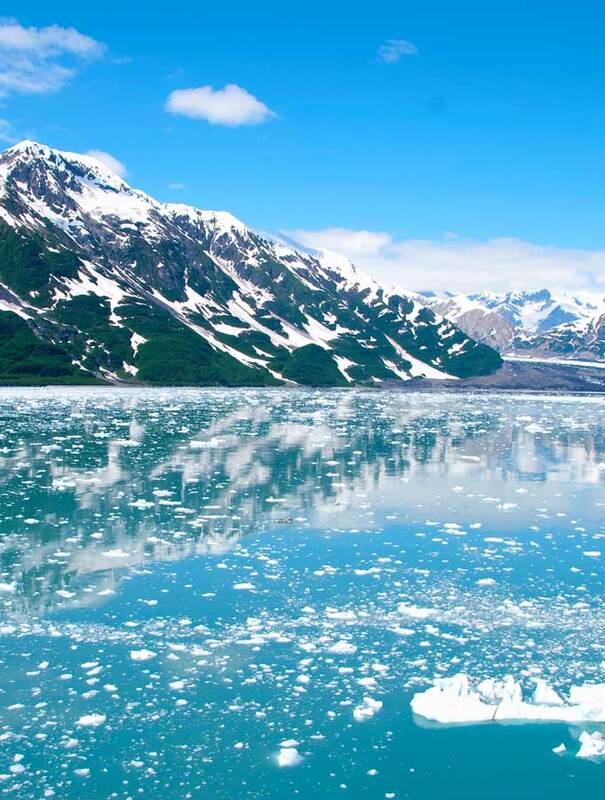 With wildness ranging from the icefields that feed tidewater glaciers, to the bountiful wildlife of the countless coastal estuaries and the rugged mountains in between, the famous Kenai Peninsula is a wonderful capsule of many, “Alaskas”. 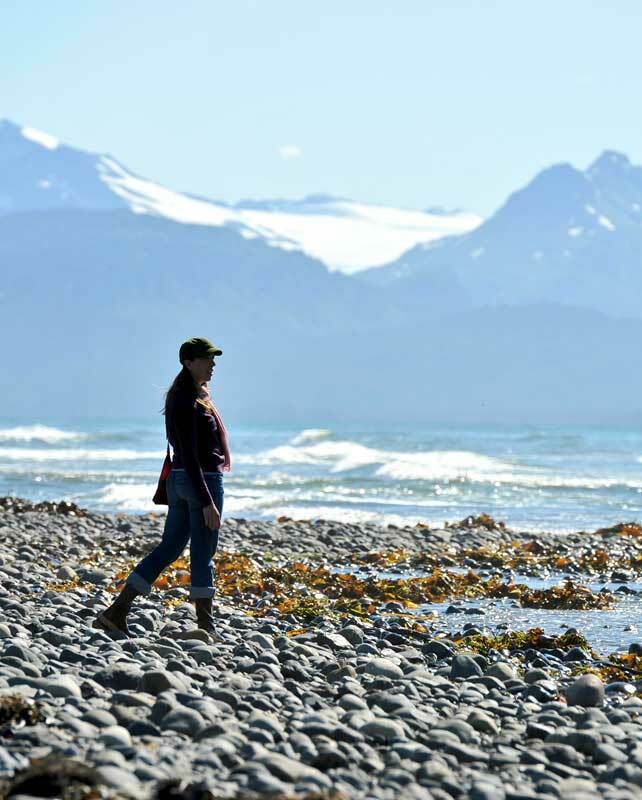 This six day tour offers the Kenai at its best, with a delightful and leisurely variety of contrasts including overnight stays: in world-renowned Seward, in a coastal village inaccessible by road and an historic end-of-the-road mountain town. We start by following along Turnagain Arm through the mountains to reach Seward at the head of Resurrection Bay, for an afternoon sea kayaking and a hike to Exit Glacier. The next day we explore the spectacular marine world of the Kenai Fjords National Park and Chiswell Islands Wildlife Refuge, lingering off the face of the calving Holgate Glacier. From Seward we travel the Kenai Mountains to the scenic gold rush community of Hope, overnighting in log cabins on the edge of rushing Bear Creek. On the third day the road leads along Cook Inlet and the towering volcanoes of the Alaska Range to explore and overnight in delightful Homer. The next morning we make it to the end of the Homer “Spit” for the boat trip across Kachemak Bay to the secluded fishing village of Seldovia and our waterfront bed and breakfast. On Day 5, we cross the bay by air taxi, before heading back to quiet Hope and the creekside cabins. Day 6 we round Turnagain Arm and stop in Girdwood and the famous resort of Alyeska, before returning to Anchorage in the afternoon. If time is somewhat limited, or you’re looking to add some authentic Alaska to your existing plans, this special tour carefully skirts the crowds and promises an unencumbered and wild tranquility guaranteed to satisfy.